I wanted to design one more monster to go with the theme of this month’s RPG Blog Carnival, “What Walks Into Town?” hosted by Scot Newbury over at Of Dice and Dragons. I have tons of baddies rolling around in my head and written down in the notepad app on my phone, but which one to choose? Luckily my friend, fellow blogger, designer, author, and artist Dave Gibson literally dared me to write this post. Check out Dave’s awesome webcomic and blog 5-Minute Workday. It all started a few weeks ago when I had the pleasure and privilege of interviewing Wolfgang Baur, Kobold in Chief at Kobold Press, for The Round Table podcast about his Kickstarter for the Tome of Beasts and Book of Lairs. (Which you should absolutely checkout if you haven’t already because we’re talking over 300 new monsters for fifth edition Dungeons and Dragons plus a bunch of dungeons, digital maps and tokens ready for print-out and virtual tables, and a heck of a lot more.) We were discussing the various backer rewards and the highest tier allows a backer to name an entirely new monster and Kobold Press will stat that bad boy, put it in the Tome, and give it a home in the Book. I jokingly suggested to Wolfgang he might have to publish a book with a Giant Ice Cream Bunny if the right (or wrong depending on your perspective) person had the cash to throw at him. He laughed at the idea nervously and implied he hoped no one would take that suggestion seriously. Then we moved on and talked of alseid, eye golems, and bouda. A week later the interview went live and I soon found myself withan amazing, life-altering series of direct messages on Twitter from that beautiful genius Dave Gibson (who is a frequent guest on The Round Table himself). That link he sent contains the art Dave created pictured below. This challenge could not be ignored! Look at that thing. If you’re not terrified, then you’re more machine than human. 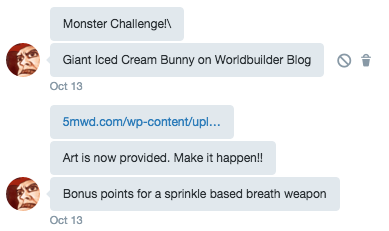 So it is with Dave’s blessing and encouragement I introduce to you the giant ice cream bunny. Few have been to the elemental Plane of Sweets. Even fewer have been to the plane’s Arctic Ice Cream Wastes. Fewer still have met one of the waste’s nightmarish hunters and lived to tell the tale. Of course an adventurer need not travel across the planes to find a giant ice cream bunny. Conjuration spells meant to call friendly-by-comparison air, earth, fire, and water elementals sometimes go awry and connect to the Plane of Sweets, bringing forth unimaginable horror from a land so tasty. Sweet on the Outside, Death on the Inside. When they’re laying in the wastes, ice cream bunnies blend in with the background, appearing to be another enormous pile of scooped confection. Yet when that frozen delight moves to form a 15-foot tall, two-ton, sprinkle-breathing, elemental rabbit with an angry cherry bomb atop its head, many soon learn the Ice Cream Wastes are not as delicious an adventure location as they seem. Cold Fury. Giant ice cream bunnies despise other living creatures, particularly humanoids who are known to delight themselves by consuming frozen diary treats. The giant ice cream bunnies see killing and devouring humanoids as a kind of cosmic revenge that’s hardwired into their nature. Savage and unforgiving, the bunnies do not flee from battle and fight with every dying breath. They want to see all non-ice cream life devoured by ice cream. Available in a Variety of Flavors. Giant ice cream bunnies come in various colors which reflect the flavor of their ice cream bodies and sometimes a single bunny is made a of variety of these flavors. All are equally deadly whether made up of pure vanilla bean or death by chocolate. Deliciously Cold. Whenever the bunny is hit by an attack or fails a saving throw that deals cold damage, it heals for the number of cold damage points dealt by the effect. Ice Cream Headache. 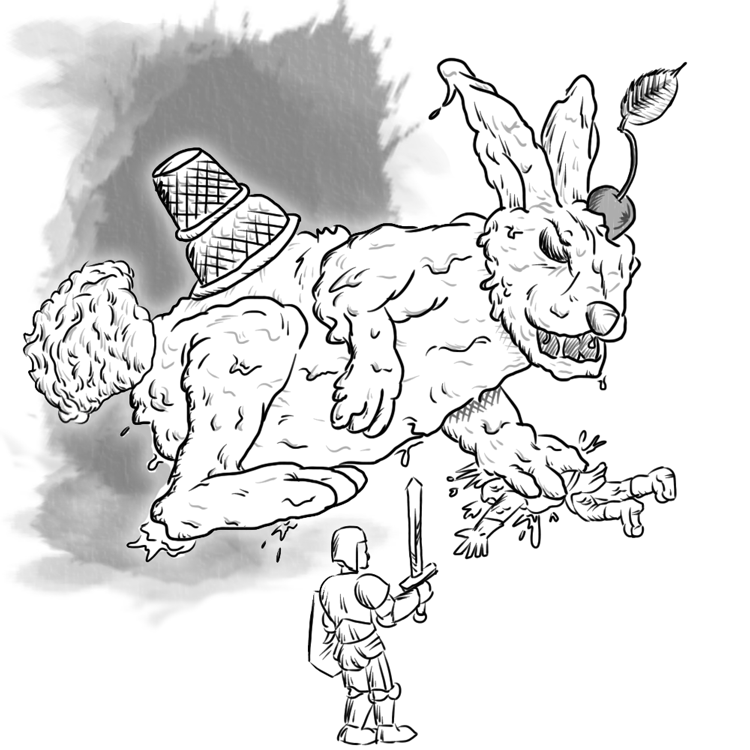 Whenever the bunny scores a critical hit with a melee attack, the target must succeed on a DC 18 Constitution saving or become paralyzed until the end of the ice cream bunny’s next turn. Snow Walk. Difficult terrain composed of ice or snow doesn’t cost the bunny extra movement. Sticky Aura. All ground within 10 feet of the bunny is difficult terrain. Multiattack. The bunny makes three attacks: two with its slam and one with its bite. Bite. Melee Weapon Attack: +11 to hit, reach 10 ft., one target. Hit: 17 (2d10 + 6) bludgeoning damage plus 4 (1d8) cold damage. Slam. Melee Weapon Attack: +11 to hit, reach 5 ft., one target. Hit: 13 (2d6 + 6) bludgeoning damage plus 4 (1d8) cold damage. Breath Weapons (Recharge 5-6). The bunny uses one of the following breath weapons. Hot Fudge Breath. The bunny exhales scalding hot fudge in a 60-foot line that is 5 feet wide. Each creature in that line must make a DC 18 Dexterity saving throw, taking 54 (12d8) fire damage on a failed save, or half as much damage on a successful one. Sprinkle Breath. The bunny exhales exploding rainbow sprinkles in a 60-foot cone. Each creature in the area must succeed on a DC 18 Constitution saving throw or become blinded for 1 minute. A creature who failed its saving throw can repeat the saving throw at the end of each of its turns, ending the blinded condition on a success. Cherry Bomb. The bunny hurls the cherry atop its head up to 150 feet and it explodes in a 20-foot-radius sphere. Creatures in the area must make a DC 18 Constitution saving throw. Creatures who fail take 35 (10d6) cold damage and are stunned for 1 minute. Creatures who succeed take half damage and are not stunned. A creature who is stunned in this way can repeat the saving throw at the end of each of its turns, ending the stunned condition on a success. The bunny cannot use this ability again until it completes a long rest. Would you like to have this ridiculous and horrifying monster in a PDF? Grab it below by itself or alongside the other monsters I’ve created on this blog.